Mom, the Intern: Eat food. Not too much. Mostly plants. First, I want to thank you all for your words of wisdom regarding infant sleep. I realized during the middle of the night, I was "jumping the gun" (in a drowsy haze, mind you) with Baby Guy and feeding him before I was even sure he was hungry. Since my last post, I've been waiting until I'm sure he needs food before I get up to feed him. Three times, he's been convinced he's more tired than hungry and has fallen back to sleep until a reasonable hour. Only once (last night, actually) was he truly hungry at 3 a.m (I know he was because he was standing in his crib, wailing for me). Now, it's time for a book review. 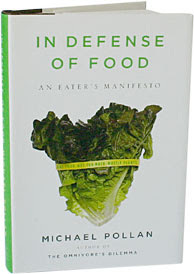 I recently finished reading Michael Pollan's In Defense of Food. It was fantastic. I have to warn you, though -- don't read this one if you are content to continue eating processed, refined food-like substances. I can promise you it WILL change the way you think about food. The premise of the book is simply the title of this post: Eat food. Not too much. Mostly plants. It's a fairly basic concept, one we all know but don't know how to put into practice. Why? Because, as Pollan asserts, we (meaning Western civilization) are more concerned with nutrients than we are with whole foods. We're also more concerned with avoiding the bad instead of eating the good. Yet, we're too lazy and cheap to go about getting the "good" the right way. So, we eat our refined grains, processed sugars and meats and hydrogenated fats. As long as the right nutrients have been injected, it's all good ... right? Wrong. We let chemistry, not biology, determine what we eat. We forgo whole foods for fake foods. Pollan encourages readers to go back to their roots and eat "only what your great-grandmother would recognize as food." Be an active participant in the acquisition and preparation of your food -- grow a garden, buy from local farmers and cook your meals. Sit down to eat and eat slowly. Eat real food, not food-like substances loaded with foreign chemicals. Spend more money on less food -- in other words, buy high-quality, healthy food and eat fewer calories in general. The first two-thirds of the book presents very convincing evidence of how rotten the Western diet is, and the last section tells you how to avoid it. Anyway, if you are tired of all the diets and health claims and want simple, innate guidance about how to eat, read this book. Sounds like a really great book, I'll have to read it. And your produce looks beautiful. And I too am guilty of sleep-walking into my son's room at the slightest peep, and only five minutes into nursing do I realize what I've done.. and here I wonder why he is 11 months and not sleeping through the night. Gotta work on that! I love that book. It changed my life. I like that the steps are so simple and straight forward. It makes so much sense. i really love that book. brilliant. Did you ever see Food, Inc?